Only a few people in the village will recognize this scene; both the wooden building and the thatched cottage have been gone for many years. This is the hall for the Salvation Army and it was located on Long lane opposite the end of Short lane. Around 1969 the current Salvation Army building on Silver street was built and there was a big procession to the news site. 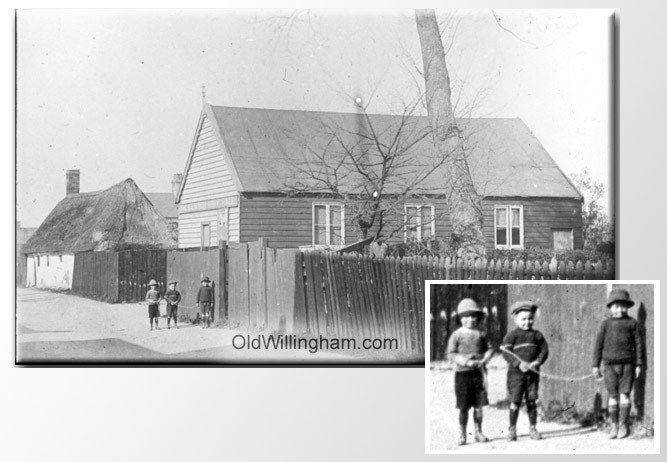 This picture is taken looking away from Church St probably in 1920’s and three young lads have decided to get into the action (see insert.) What splendid hats!